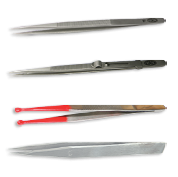 Find the best tweezers for your jewelry pieces with our collection! Shop items with locks or rubber tipped, perfect for diamonds, gemstones & more. Get the best prices thanks to our regular discounts!